Colorado Rockies first baseman Ian Desmond (20) throws to first base on a ground out by San Diego Padres shortstop Freddy Galvis (not pictured) during the ninth inning at Petco Park. Swept by the Dodgers at Coors. 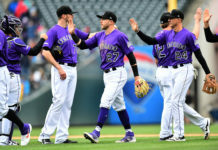 That’s a team that has so much – money, talent, depth, tradition – that when they’re vulnerable, a team like the Rockies must go for the jugular anytime it’s exposed. The Rockies didn’t, and as a result, the NL West standings on Friday morning looked considerably different than they do this morning. One weekend. One sweep. One (and a half) game out of first place. One game ahead of fourth. Did things just become really interesting out West, or is this the series they’ll point to if and when the Rockies are eliminated from the postseason? Nobody believed the Dodgers were dead and gone, or that they wouldn’t return back to form by season’s end, but make no mistake, the jugular was exposed in all three games played in LoDo this past weekend. But instead of taking advantage, the Rockies let the flopping Dodgers right off the hook. Having had the lead in all three games, and having scored 19 total runs over the series, it’s all too easy to pin the losses Rockies pitching, specifically the bullpen. 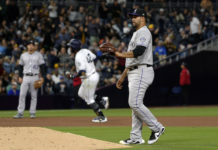 Bud Black got decent (not great, not disastrous) starts from Tyler Anderson (5.0 innings, left with the lead), German Marquez (6.0 innings, 4 runs allowed, left tied) and Chad Bettis (5.2 innings, left with the lead), but didn’t get much help from middle relief (or even closer Wade Davis, who gave up three runs in the ninth on Sunday afternoon). Even though the Rockies’ bats came alive to some degree, their 19 runs were nothing compared to L.A.’s 33. Pitching. It’s easy to point the finger there. But it shouldn’t be, and isn’t quite that simple. Look over at the not-so-hot corner. Want to point the finger at something? Point it at first base. It’s no secret that Ian Desmond is struggling. His massive contract is crippling, considering that the Rockies haven’t gotten much production out of not only Desmond, but out of his position – and first base better produce offensively. As the starting first baseman on both Friday and Saturday, Desmond went a combined 0-6, he tallied no RBI and made the final out as the go ahead run on Friday night. On Sunday, Desmond moved to the outfield and went 1-for-3 with a three-run homer in the first inning. His replacement at first base however, went 0-for-4. Rookie Ryan McMahon, who many believed would be the answer at first heading into the season, struggled at the plate; that’s nothing new, as the youngster is hitting just .216 on the season. But perhaps more crucial, was the defensive play he didn’t make in the top of the sixth with two outs in hand. Technically, Rockies shortstop Trevor Story took the error with a bad throw that skipped just in front of McMahon’s mitt. But the truth is, a major league first baseman makes the play. The ball got past McMahon and two runs scored. Sure, the Rockies ended up losing by three, but the error changed the complexion of the entire game, including the use of the bullpen. So, in total, Bud Black got 0-for-10, zero RBI and a critical, critical error from the first base position against a team that should have been kicked while it’s down. Meanwhile, Rockies outfielder David Dahl just went down with a broken foot – he’ll likely be out 6-to-8 weeks. Wouldn’t Desmond, a more natural outfielder than first baseman who’s hitting .192, be better suited as one of Black’s many options in the outfield? How much money Desmond makes shouldn’t matter; if he can’t hit, he shouldn’t play. 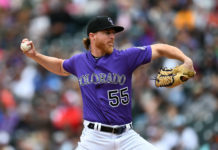 The Rockies must do one of two things in two months that lead up to the trade deadline: Either allow McMahon to learn the position (as well as how to hit big league pitching), or, better yet, go get an established first baseman. Heading into the season, there was a belief that this was a Rockies team that could compete for a division title, playoff spot or even a World Series. It’s a team that’s still complete – it’s likely we’ll never see Nolan Arenado, Charlie Blackmon, D.J. LeMahieu and Carlos Gonzalez all on the same roster again. Pair that lineup with a bevy of young, tough starting pitchers and a bullpen that includes Jake McGee, Bryan Shaw and Wade Davis, and the Rockies are built to win now. And now is when they need a first baseman more than ever. The Rockies should be “buyers” long before the trade deadline; if they wait that long, it might be too late. It would be nice to bring in someone like Jose Abreu. Many believe it’s the trade deadline move that makes the most sense for both player and team. The Rockies have assets and Abreu could be the difference between making the playoffs and not. But even if Abreu isn’t the one, it’s imperative to find someone who can be productive at first. Yes, the bullpen can always improve, but if the Rockies want to win this season, they’d better handle first things first. It’s the only way to stay in first.